Well, first of all apologies! I have been a bit slack on the blogging front - and this mainly because I've had a lot of work and also been travelling here there and everywhere. For a lot of October I seem to have been on holiday. It sounds wonderfully decadent but in reality a lot of things just all happened at the same time - and it would have been rude to say no! 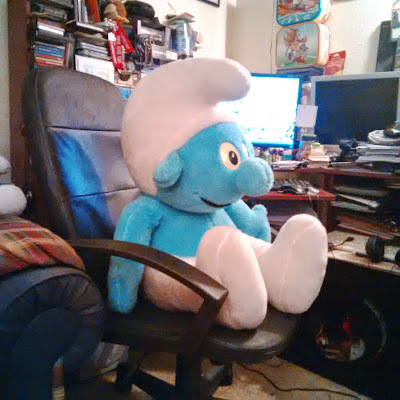 Some of the more observant among you will notice I'm a bit of smurf collector (ok, ok - a huge smurf collector). Once a year I make the pilgrimage to Belgium for an annual smurf collectors fair and this was just one of my trips. This really is one of my favourite times of the year. It's a chance to be with amazing friends from all over the world who all have the same interests and loves. So here are a few (ok, a lot) of pictures from the week. This is the hotel I stayed in at Evergem, nr Gent. It's called the Eremyten Hof and has beautiful grounds. My room was the top left window! The day after the fair, we all went to Gent for the day. An amazing place - a day wasn't long enough. One of the many beautiful bridges - note the great blogger pose - not. So..small car + big smurf = embarassing car journey home! But the little guy seems right at home!!! Hope you enjoyed my little snapshot on my Belgium trip - I'll do a couple more updates very soon.